Hyosung’s Rush 50 epitomises the neo scooter revolution. Traffic congestion is for everyone else, parking’s a cinch, there’s storage space galore, and the instrumentation is hip. In other words, nothing’s an obstacle. It’s agile, comfortable and confidence-inspiring, with large 12-inch alloy wheels carrying the load, and a hydraulic disc (front) and drum (rear) brake combination working in concert to provide predictable and safe braking. Then there’s the infectious zip from the 50cc two-stroke air-cooled engine, channelling its wares through a slick automatic transmission. Economy is exceptional. The Rush 50: a stylish solution to the everyday humdrum. 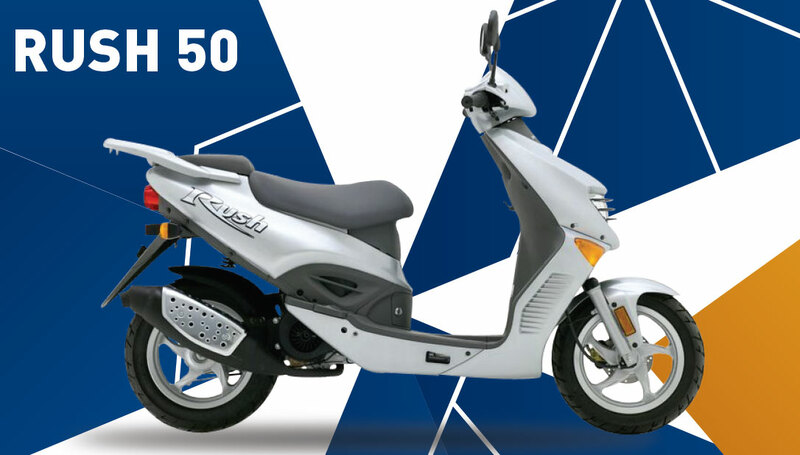 The SF50B/Prima is a scooter that offers a powerful 2 stroke engine with electric start, fan forced cooling, free flowing exhaust, and V-belt auto transmission for maximum acceleration. The Prima’s characteristics such as a hip instrumentation panel and comfortable ergonomics, combine comfort with style and luxury. Passenger pegs for two up riding. MSRP – See Dealer for current pricing. Hyosung Notes : Specifications and pricing are subject to change without notice. Images for illustration purpose only.